Home News Smartphones Alcatel One Touch unveils Idol and Idol Ultra One Day Sale this June 1, 2013! 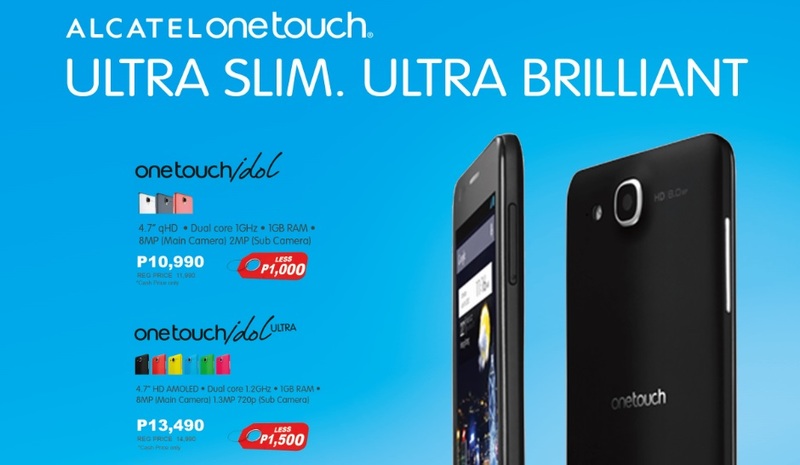 Alcatel One Touch unveils Idol and Idol Ultra One Day Sale this June 1, 2013! Alcatel One Touch has just unveiled a "ONE DAY SALE" on Saturday, June 1 from 4pm-6pm in all Alcatel One Touch kiosks nationwide. Items on sale are non other than the Alcatel One Touch Idol (Now Php10,990) and Idol Ultra (Now Php13,490), the thinnest smartphone in the market to date! More details after the jump. The Alcatel ONE TOUCH Idol Ultra smartphone is the thinnest smartphone yet. The device breaks current market records at 6.45mm thin. Performance is not compromised in this design with features such as a stunning 4.7'' HD AMOLED display, a 1.2GHz dual-core processor, 8MP camera that captures 1080p video, and running on Android Jelly Bean. Now Php13,490 (SAVE Php1,500) - Cash Price only! In the same product line, the Alcatel ONE TOUCH Idol also breaks current records, weighing in at 110 grams (3.88 oz) making it the lightest smartphone in its category. The device's dual-core processor and Android platform provides a feature-rich experience and supports a large, bright 4.7" IPS display, 8MP camera and 2MP front camera, running on Android Jelly Bean and offered in premium brushed metallic finishes. Now Php10,990 (SAVE Php1,000) - Cash Price only! Available in all Alcatel One Touch Kiosks nationwide - SM North EDSA, SM Naga, SM Megamall, SM Fairview, SM Southmall, SM Calamba, SM Dasmariñas, SM Cebu, SM Iloilo, SM General Santos and SM Lanang.